Dr. Gary A. Raiczyk is the owner and staff Veterinarian at Angel Parkway Pet Hospital. 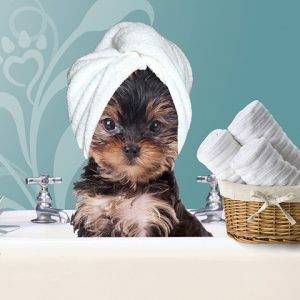 He has been serving the pets of North Texas for over 20 years and has experience as a previous owner, associate veterinarian and emergency clinician. He is a graduate of the University of Pennsylvania School of Veterinary Medicine and has also spent time at Texas A&M College of Veterinary Medicine interviewing students and helping on the Ethics forum. His special interests are internal medicine, dermatology and surgery. 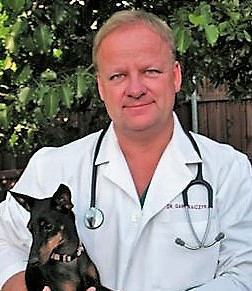 Dr. Raiczyk is a member of the local, state and national veterinary medical associations, and keeps current on all new advances in veterinary medicine through continuing education seminars, journals and online reading. Outside of the hospital, Dr. Raiczyk enjoys spending quality time with his wife and two daughters. He also enjoys travel, music and sports, in addition to caring for his 2 cats and 2 dogs. He has been a past recipient of a “Veterinarian of the Year” award from a local veterinary association. He has been a past director of Golden Retriever Rescue of North Texas and Search One Rescue. Dr. Sarah Byrd grew up in Lucas, Texas and is a 2017 graduate of Texas A&M University with her doctorate of veterinary medicine. She loves practicing on all animals and expanding her knowledge in all aspects of veterinary medicine. Dr. Byrd enjoys hiking, fishing and being in the great outdoors with her husband Cameron and their two dogs, Delilah and Winters. She also enjoys pleasure riding her retired barrel horse Napoleon. Brandi was born and raised in Indiana. She graduated with a Criminal Justice degree from Ball State University. She previously worked as a Probation Officer but quickly realized her passion and drive to work with animals. She has previous veterinary office experience and has also worked for an animal shelter. She relocated to Texas a few years ago with her husband, step-daughter and two fur-babies, Bane and Loki. She has been to over 250 concerts. The only bone she has ever broken is her big toe. Hi there! My name is Liz and I have been a vet tech for 7 years. In that time I’ve worked with all kinds of critters and have loved every minute of it! Coming from Florida, I love fishing and sailing. Horseback riding, hiking, and painting are a few more of my favorite pass times… when there is time to pass haha. My husband and I have 3 kids. A human daughter named Alice and 2 fur kids named Roxie(an Australian Shepherd mix) and Riley(he is just a Heinz 57). Her favorite Disney movie is The Little Mermaid. Foxes make her cry (in a good way!). She loves The Lord of the Rings. Whitley grew up in Allen, TX. She graduated from Allen High School in 2013. She earned her Bachelors Degree for Animal Science from Texas A&M University-Commerce in 2017. She lives with her boyfriend, Austin, her 4 dogs: Diesel (6), Pixel (4), Miles (2), Sadie (2) and bearded dragon, Wizard. She enjoys all activities she can do with her pets including paddle boarding, hiking, and going to the park. She has a small business making dog collars and other pet accessories. Her favorite genre of music is Country. She has known her boyfriend since the third grade. Hello! My name is Stephanie. I have been a Vet Tech since 1996 and it’s the best job in the world. All of my experience comes from hands on training in general, emergency, and internal medicine practices. In my free time, I’m busy with my daughter and her softball team. I really enjoy spending time with friends and family. She enjoys spending time at the lake and doing extreme water sports. She has 3 furry kiddos: an orange tabby named Thor, a Maltese named Hurley, and a Springer Spaniel named Sadie. Hello, I’m Shawnda. I have a B.S. in Biology from UNT and have been working in the veterinary field since 2006. I am originally from California; I have a son named Connor and four cats. I enjoy doing volunteer work with some of the wildlife rescues in the area, as well as helping out with the prairie restoration project in Lewisville. My other hobbies include going to rock concerts, being outdoors & working in my vegetable garden. I love food and coffee; I am super passionate about the environment and Cavalier King Charles Spaniels. She has worked at 2 previous clinics with Dr. Raiczyk. Hello! My name is Rachel. I grew up in Antioch, Tennessee on 8.5 acres. I have had a passion to work with animals both wild and domestic all my life! I am a licensed Wildlife Rehabilitator for Texas Parks and Wildlife. I spend my days taking care of your fur babies and at night I spend most of my time with my wild babies. I also have a degree in Medical Assisting. My family and I have a sweet Service Dog named Nika, a Bearded Dragon named Spiky, and 2 fish named Batman and Superman. I have many years experience working with animals of all kinds. I can’t wait to meet you and your furry family member! She loves hiking, fishing, and camping. Her favorites living creatures are frogs. She considers the Kestrel Falcon to be the coolest wild baby she has ever rehabbed/released. Brooke was born in Leavenworth, KS, but has lived in Texas most of her life. She graduated from Allen High School in 2014 and is currently pursuing her MA Certificate to become a Radiology Tech at Collin College. In her free time, she loves to spend time in Nevada, TX, with her boyfriend, Dakotah. She has a 4 year old, yellow lab, named Boomer and an 8 year old chocolate lab, named Bella. She is a country girl at heart. She is a lover of cows. Her favorite color is maroon. Hey there, my name is Courtney! I am a recent graduate from Texas A & M University Commerce where I received my bachelor’s degree in Animal Science with a concentration in Pre-Veterinary Medicine; I am currently applying to veterinary school (YAY!!). My boyfriend and I enjoy snowboarding and traveling when we can, plus hiking and canoeing with our dog, Aero. In addition to our dog, we also have two cats named Sly & Sophie. Taryn previously groomed pets in Austin, TX before making her move back to the area and joining our clinic. Female dog bites are twice as numerous as male bites.